Just a few months after central Italy was battered by a magnitude 6.2 earthquake, the region has been struck again, and harder. 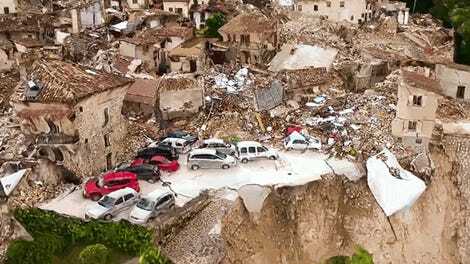 A magnitude 6.6 quake—the strongest in the country since 1980—caused widespread damage to many of the same towns that were most severely affected by August’s incident, like Amatrice, Sunday morning. Over 200 aftershocks were measured after the initial quake in Norcia, the New York Times reports. Seismic activity four days prior acted as a bellwether, giving residents time to evacuate. As a result, only 20 injuries were recorded; by contrast August’s quake claimed nearly 300 lives. However, the BBC reports that the over 15,000 people who fled the quake are now homeless, living in tents or other temporary accommodations.